I am glad that you guys ask so many questions because that way i know much better what you are interested in hearing and i try to listen to that. 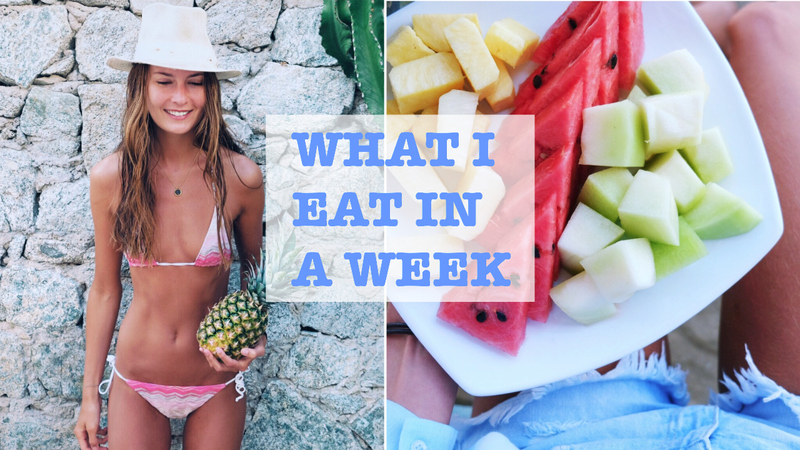 As a ‘what i eat in a day’ posts seem to be the most requested ones at the moment, i thought i’d share a whole week of food with you. That way you get a better idea of what i eat on average since one day can vary a lot from other days. Absolutely LOVE posts like this! Would love to see more similar posts! Hi, Caroline. I love your blog. I have learned so much from you! I have been trying the raw until 4 diet lately, and it has been working great. I did read that people who eat a lot of fruit have to be careful with their teeth enamel because it can be damaged by the acidity in the fruit. Have you run into that at all or do you do anything to prevent it? You have a beautiful smile, so it doesn’t look like it is an issue for you. First, you’re amazing. Second, I love your posts about what you eat, like this one, but is there any way you could make a shopping list? Including the ingredients for your green juice for a week? I would really appreciate being able to print it out and go to the store! If you’ve already done this and I just missed it can you link me? Which curry sauce do you recommend. ? Or do you have a receipt ? Hi! Thanks so much for all your wonderful support and tips. What is your favorite salad dressing? I see you use lemon juice. What else do you use for salad dressings? Also, how do you cook your bake potatoes? With olive oil, salt, pepper? Do you ever drink soy milk or almond milk? also, do you eat oatmeal? I am addicted for your plans and I tried to complete them with all my power , i have been vegan for 2 years and I am still , but I always crave chocolate (I hate dark chocolate since they don’t let me feel satisfied ) can I do something ? Also, do you snack during the day, if so, what do you eat? Thank you! Thank you so much! So happy to hear that you feel inspired :):) I don’t eat a lot of nuts and don’t drink a lot of vegetable milks as I usually have fresh fruits for breakfast and don’t drink coffee. However, I do love coconut milk for curries and love to have some cashews, macadamia or Brazil nuts here and there :). Hope that helps! Just a little question what’s your weight and height?? I am 1,79m tall and don’t weight myself. This lifestyle is all about eating in abundance and weighing doesn’t quite go with that as I don’t want to focus on a number on the scale :)Hope you understand. P.S. I love your blog. You really are a very beautiful person. How do you manage bad cravings when travelling and not feeling tempted to eat the wrong things and overindulging bad foods when hanging out with your friends? What do you think of juice cleanses as part of a HCLF diet? As in incorporating these cleanses every so often? I love cold pressed juices, however, I don’t recommend to only drink juices and not have solid food for a long period of time. The good part is that your body can rest and has more time to detox and heal itself if you only drink juices. The negative part is that your metabolism is slowing down a lot and your body thinks its “starving” which means it won’t burn a lot of calories anymore and instead will hold on more to the food you are eating after your cleanse. I did 2 juice cleanses for 5 days each before I went vegan and felt AMAZING during that time, however, at the end of the 5 days I was craving everything i could think of and had so much more food than i would have had normally. It didn’t make me feel good in the end and i even felt like i gained weight at that time. Sorry for my on response, I just thought I share my own experience to help you as I really didn’t find it helpful at all. I think its great to start every day with a healthy green juice and even have another one before lunch but I wouldn’t replace food completely with juices. Hey Caroline:) because im not o big fun for dates, can i use apples instead? of course you can use any fruits instead. Just make sure you are getting enough calories in 🙂 Apples are much lower in calories compared to dates so you have to eat more or add other fruits as well :-)))! You are such a lovely presence in my day. Eating more fruit and going vegan have totally changed my life! I would not have done it without this blog. Thank you! My question for you is: do you eat dried fruit? (Apples, pineapple, and mango are my favorites) They seem such an easy snack, but make me feel so bloated. How do you avoid bloating with all of the fruit? Even when I eat it before cooked foods it seems to be a problem. Thank you! I’m so grateful for this blog. The best way to avoid bloating is to eat as simple as possible and if you feel like you are having are hard time getting rid of it, eat mono meals for a few days / weeks. That means having one type of fruit for breakfast, one for lunch etc. and not mixing any fruits/ veggies. Drinking a lot of water and working out (especially running) also helps a lot to keep you tummy flat. If you still feel bloated, I would suggest to do a colon cleanse. This can either be done at home with an enema or at a medical spa in form of a colonics. Its a very powerful treatment and can help a lot with digestion issues, bloating, skin issues etc. being underweight can cause all sorts of issues. It can definitely be the reason that you don’t get your period and and that don’t grow as tall as you are supposed to be. I highly recommend you to eat at least 2500 kcal a day and without doing so I don’t think anything will change. Dates, bananas and all other fruits will never make you fat, however, I think you need to change your mindset about what “fat” means first! From what you are describing, you probably NEED to gain weight and its great to do that in a healthy way with a plant based diet. 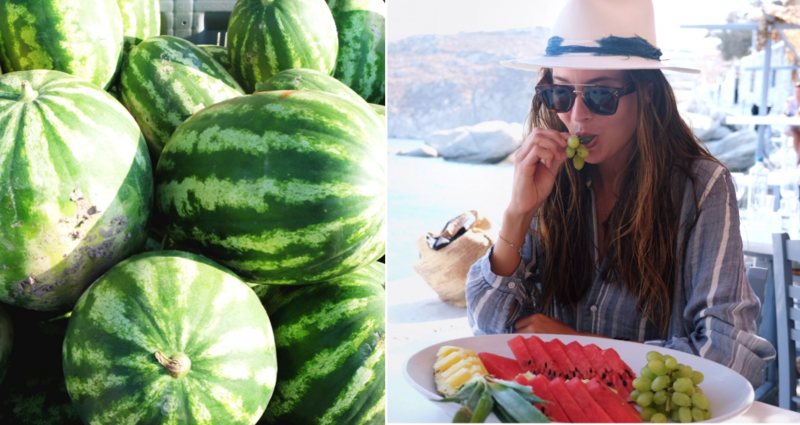 I am mostly fully raw over the summer when its easy to get good quality and ripe fruits. Over the winter months i really like to have a cooked warm dinner and am looking forward to that during the day. However, I do see a difference when i eat fully raw as I feel like I need less sleep and have even more energy. Maybe it is also a mic of getting more sunshine during the summer as well but i def recommend to try it or to implement 1-2 raw days per week. My protein sources are mainly: spinach, kale, broccoli, bananas, potatoes, sweet potatoes, chickpeas, nuts. Do you have any agave syrup? Do you eat coconut and drink coconut water? Do you ever have any type of vegan yogurt? I took antibiotics and lost all my nice bacteria my gut flora is very weak right now and I am very swollen, from head to toes, I suffer a lot from swelling legs, what would you recommend? Do you ever drink any vegan milk, like soy, rice or oatmeal? What do you use as the base for your smoothies? Hope you can help, thank you very much! First of all thank you so much for your blog and for all of your posts ! Sharing it with us is very generous and kind ! I’m following you since few time, and I’m reading your blog every day very carefully. I have a question: in fact, I can not workout at the moment, and I don’t know yet when i will be able to go back to the gym ! So I wanted to know if you have this kind of diet every day, I mean the days you work out and the days you don’t ? Did you get headache or others consequences when you started your diet? Sure but how long did it take time? It seems impossible to eat only fruits, vegetables, potatoes etc everyday for breakfast, lunch, dinner etc because they don’t give a lot of energy. Even if I eat many fruits, I still believe that I’m too fragile so I’m not convinced and doubt the vegan diet. How can you replace meat or protein stuff? if you feel like you are not getting enough energy from fruits than you need to eat more. Make sure you eat around 2500 kcal per day at least. Fruits, dates, potatoes, veggies, greens, rice etc. give you much more energy than animal proteins. They are also much easier to digest which means your body can break down the sugar easily and fuel your cells. All fruits, dates, veggies, beans, greens, etc. contain protein and there is no need for additional protein supplements! thank you so much for the kind message. So glad to hear that you feel inspired!! 🙂 First of all any workout is better than not working out!! :) keep that in mind:)! I love cycling!! Its such a great way to sweat and have fun, boxing and muay thai are great workouts as well and make you strong and toned. A mix of different workouts is always great! – Bananas (buy a big box so they can ripen up at home), Apples, Pears, Oranges, Mangos, Pineapple, Melons (only if they are ripe), Medjool Dates (I usually buy a 5kg box as they are cheaper), greens (spinach, rocket, lettuces, kale..), tomatoes, cucumber, bell peppers, celery, zucchini, avocado, potatoes (always buy organic as they taste so much better), sweet potato, pumpkin (kabocha squash is my fav), ..these are things that i have at home all the time and then its good to have some staples like coconut milk, curry powder, onions, garlic, tinned tomatoes, etc. but i don’t use that every day. thank you so much! :-) So glad to hear that. i was already quite skinny before going vegan and I didn’t notice any weight loss at the beginning. However, I felt soooo good eating these large amount of fruits, having tons of energy, never restricting myself, etc. Over time I def lost a bit of weight, got more toned and feel like it is impossible to gain weight no matter how much i eat. This lifestyle will teach you so much about loving yourself, taking good care of yourself and being happy that i think you should def try it!! Eating as much as you can and never thinking about food in a bad way is so liberating and will automatically prevent you from binging. The best tip to not crave junk food is again the high carb vegan lifestyle. You are eating A LOT of fresh ripe fruits, dates, potatoes etc. that your body will be satisfied due and not craving unhealthy foods. i always take fruits, dates etc. with me or just buy these at local supermarkets or go to healthy lunch places. Please don’t focus on weight loss. I am sure you will lose weight on that lifestyle but it is so negative to focus your mind on that. Concentrate on being the healthiest version of yourself and always eat as much as you want without counting calories. loves to eat healthy as well but he is not vegan:-). Have a lovely rest of the day. Im from Denmark. Love your blog. Dates? What is that? Medjoul dates are the sweetest fruits and best snack ever 🙂 Im sure you will find them in denmark!! I love your blog! I was vegan for a year and became anemic and had to go back. I really want to be able to be vegan again for good, but I need a solution! How do you get a lot of iron? Is it bad to take supplements? Hi Bridget, all leafy greens like spinach, kale, collard greens, broccoli etc. are a great source of iron. Also chickpeas, sesame seeds and beans have iron. My favorite way to get iron is to make green smoothies as the body absorbs all the nutrients even better that way :-). Hope i could help! First of all, i love your blog! You Seem so at ease with yourself. Uhm, j first came across you Instagram because I saw a skinny girl in a picture. I’ve been struggling with an eating disorder for ten years now, but I’m at a point where I want and need to find a way out of it. Many people become addicted to getting fit and exercise all the time and that’s not what j want to do. I don’t want to replace my illness with another addiction. However, my concern is. I want to go vegan, but to me you just don’t look healthy at all. To me you’re so skinny, and look sick. But is this just the way you are born? Are you actually healthy? And can it be healthy for you and your body to go on a vegan diet. Or does it turn into an addiction too with eating so healthy and never have any “bad” food? Your meal plan just seem so low in calories to me. I wouldn’t be able to function on that – but you look so happy and full of energi, so my mind is pretty torn. Again, I hope this doesn’t offend you. I only want to learn and I’m so sorry if it did. Hi Christina, Thank you so much the sweet message. I am not offended at all. However, i am very healthy, have tons of energy and eat an unlimited amount of whole foods each day. I never restrict calories and eat around 2500 kcal a day. I would highly recommend you to try this lifestyle again and forget about calorie counting. It is nearly impossible to gain weight on this lifestyle no matter how much you eat (thats my own experience and i have been eating this way for over 2 years now). I am wondering how to eat that much food in a sitting. I love dates but it is hard to eat more than four of them. Does your body just get used to the intake? Also random question: do you drink water with your meals or mainly outside or your meals (some people believe it slows down digestion, was curious what you thought about that)? I usually drink water at any time 🙂 but try not to drink too much while I´m eating. What is someone ate 6,000 calories a day? Then would they gain weight? Do you take any supplements on top of the regular food (e.g. vitamins, omega 3, superfoods…)? 🙂 what are your thoughts on this? i only take probiotics at night and sometimes VB12 and magnesium (if i worked out a lot). I am not the biggest fan of supplements as i think it is always better to get vitamins and minerals from whole foods. Def check your VB12 level to see if you need to supplement that but for the rest i think focus on having lots of different fruits and vegetables :-)! A question regarding your intake of good fats. Reading your weekly meal plan shows that your are getting very little (if at all?) good fats from your food. You need fat to help you absorb certain nutrients, such as fat-soluble vitamins (vitamins A, D, E and K) and antioxidants (like lycopene and beta-carotene). Fat is also very important in giving your cells structure. Omega-3 fats, a type of unsaturated fat, are important for optimum nerve, brain and heart function. Your body utilizes fat for everything from activating hormones to building immune function. The human brain is composed of nearly 60% fat, with fatty acids that are critical in facilitating brain performance. Omega 3s (EPA and DHA) in particular are necessary for proper brain development as we know it today, and there are very few vegan sources that are high in this critical component. They include seaweed, flax, chia, and hemp seeds, with other vegan sources quite low on the list. Do you have a certain reason for excluding good fats from your diet? thanks for your message :-). This post just showed an average week of food for me. I do eat healthy fats and totally agree that they are very important and should never be excluded from a diet. I eat around 2-3 avocado on average per week but that can also depend from week to week. In summer i eat a little less fat just because i am craving more sweet fruits and like to listen to my body. Hope that answers your question :-)! wow seems delicious!! so much fruit i love it! i always thought too much is bad because of the carbs but you’ve convinced me otherwise 🙂 but what i wonder is you like fitness and normally people who have a great bodyb(your body is is beautiful i wish incohld be as skinny and toned as you!) eat lots of proteins but you don’t seem to..? just wondering if you’re maybe drinking some sort of protein shakes please let me know!! ok thank you for your reply! 🙂 so you don’t eat things such as tofu or soy yogurt/milk? breakfast: green smoothie (spinach, pineapple, banana, kiwi, orange, chia seeds, cinnamon) OR overnight oats topped with granola, chia seeds, cinnamon, and fruits. This is basically what I eat on a good day if I dont let my bad cravings take control. I know balance is everything and sometimes you have to treat yourself so you don’t feel deprived but when I crave chips and i buy chips I rlly can’t control myself and I end up eating the whole bag. same with icecream… It is hard for me to scoop out a servig of icecream and tell myself thats all im having… So food is constantly in my mind. They say you can eat anything on a vegan diet and not gain weight and that is totally not true. Any advice? Thank you for your inspiring blog! I am in awe 🙂 You have inspired me to start my vegan journey. However, now in the beginning of it all I struggle a bit with bloating. I have followed your advice to eat raw fruit and vegetables in the morning, and not after cooked food. The gas is still on, though. It will typically start after a mono meal of bananas, or after eating dates. Perhaps also oats may be an issue, in spite of the soaking of them over night/several nights. Do you have any tips for me in this regard? Did you experience bloating in the beginning of this lifestyle? Do you use a lot of oats yourself? Further, I would love your views on fodmap-foods. Unfortunately it seems like both bananas and dates are high fodmap, and I hope that my body will adjust since I love them so much. And finally; have you done a colon cleanse yourself? I read a lot of material about this subject, pointing in all directions in regard to its efficiency and healthiness. And to be hones I am a little bit scared to pull it through. It would really help if you would share your experience with me. It’s great seeing all the food you eat everyday throughout the week. Looks super healthy, but I’m wondering how much protein you are getting in comparison to all the natural sugars from the fruits. How often do you eat soya? I tend to snack on nuts quite a lot, but I’ll look up the nutritional value of dates. i usually just use a big of water or vegetable broth in a non sticky pan. How do you prepare your broccoli? Loved it! 🙂 but I have a question, do you ever eat like full day cooked? For example, oatmeal for breakfast, Buddha bowl for lunch and potatoes for dinner? Or do you always have at least one raw meal?